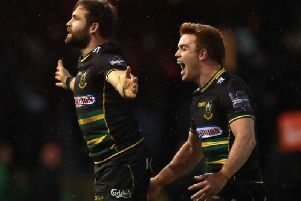 Saints marched into the Premiership Rugby Cup semi-finals with a 47-20 victory over local rivals Leicester Tigers at Franklin's Gardens on Saturday afternoon. Chris Boyd's men claimed their third win in four pool matches and will now progress to the final four. But they will not discover their opponents until next weekend's fixtures are completed. Saints will not be in action as they have a rest weekend, but the game between Sale Sharks and Newcastle Falcons appears to be key. Saints have topped Pool C thanks to picking up 15 points from their four matches. They lost at Gloucester but managed to beat Wasps, Bristol and Leicester to ensure they can't be caught at the top of the group. Saints finished with a points difference of plus 53. When will the semi-final be? The semi-final will be played on the second weekend of February. This is where it gets more complicated. In short, they will play either Newcastle Falcons or Exeter Chiefs. Saints are one of three pool winners, which means they are one of three top seeds. The other team taking part in the semi-finals will be the best runner-up and will definitely face an away tie. If Newcastle Falcons, who are currently second in Pool A, win by 37 points or more and pick up a try bonus-point at Sale Sharks next Sunday, Saints will travel to Newcastle for their semi-final. If Newcastle win with a bonus point but do not do so by 37 points or more, Saints will host the Falcons. If Newcastle lose, Exeter will travel to the Gardens as they will be guaranteed to be third seeds courtesy of winning Pool A. Will Sale take their game against Newcastle seriously? You can bet they will as Sale will not be allowed to slack off by their coaches and they can still just about qualify if they bag a big bonus-point win and Worcester suffer a heavy defeat to Wasps. Sale would also need Gloucester to lose at Bath on Saturday so it all looks very unlikely but the main reason the Sharks are likely to pick a strong side is because they will want to get some game time in the legs of key men ahead of their next league game, which comes at Saints on February 16. If Sale leave out their main men, they will not have played for some time before that Franklin's Gardens clash as they were not in action this weekend and are unlikely to be in the semi-finals, meaning almost a month without a meaningful match. Who else is left in the competition? Saracens are currently top of Pool B and guaranteed to qualify as either pool winners or as best runner-up. If Worcester Warriors claim a bonus-point win at home to Wasps and win by more than a point next Saturday, they will top Pool B. Saracens currently have 16 points so they or Worcester will be top seeds going into the semi-finals. The best runner-up could come from any pool, even Saints' as Gloucester can still finish on 14 points if they beat Bath with a bonus point. Sale Sharks could also squeeze through from Pool B, but it is hugely unlikely. Harlequins, Bath, Leicester Tigers, Bristol Bears and Wasps will definitely not be playing any part in the knockout stages. The final will take place on March 17, but the venue has yet to be announced.